As reefkeepers, and aquarists in general, know, most aquatic animals excrete ammonia as their primary nitrogenous waste product. 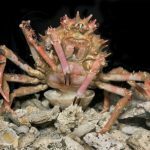 What reefkeepers also know is that Tridacnid clams, like corals, host symbiotic zooxanthellae which utilize nitrogen, photosynthesize, and provide excess photosynthate for the host. Corals (and other symbiotic cnidarians) host these zooxanthellae within their cells, while Tridacnid host them extracellularly in an intricate network of tubules just below the outer mantle surface. 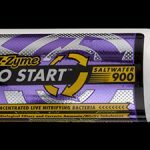 What the average aquarist may not know, however, is that these zooxanthellae symbiont-hosting organisms do not excrete ammonia. On the contrary, they actually take up exogenous (i.e., ambient) ammonia from their environment. Furthermore, we know that their symbionts are actually nitrogen-limited: in the presence of ammonia or nitrate, the photosynthesis of zooxanthellae increases, as does the growth rate of the host organism. Giant clams, like symbiotic corals, exhibit light-enhancement of calcification. They also exhibit a preference for assimilating ammonia for symbionts during daylight, taking it up at a rate during the day as high as 18 times greater than night. The site of this assimilation, and the reason behind the light dependency, has remained enigmatic. 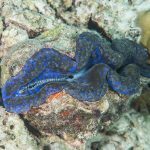 A remarkable new study in the journal Coral Reefs by Hiong and others at the National University of Singapore, and Nanyang Technical University, shines new light, figuratively and literally, on the ammonia assimilation of symbiotic giant clams. From Norton et al. 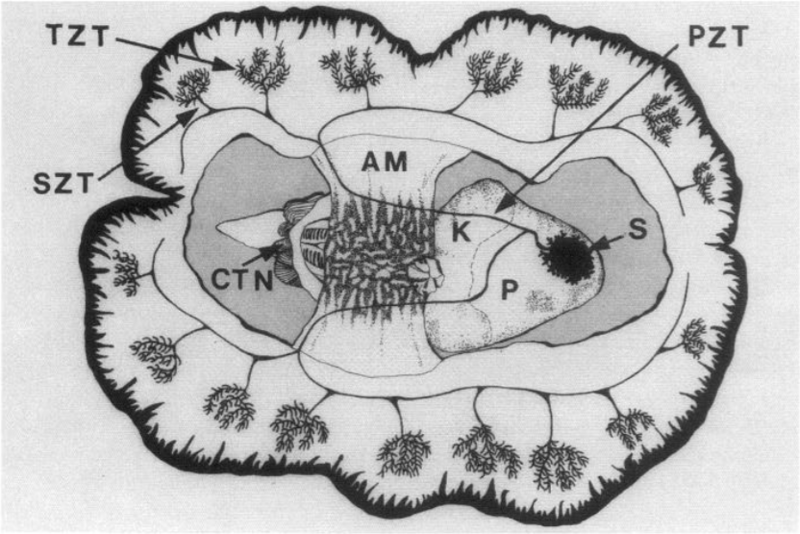 1992., medial and dorsal views of anatomical structures in giant clams, particularly those related to photosynthesis. 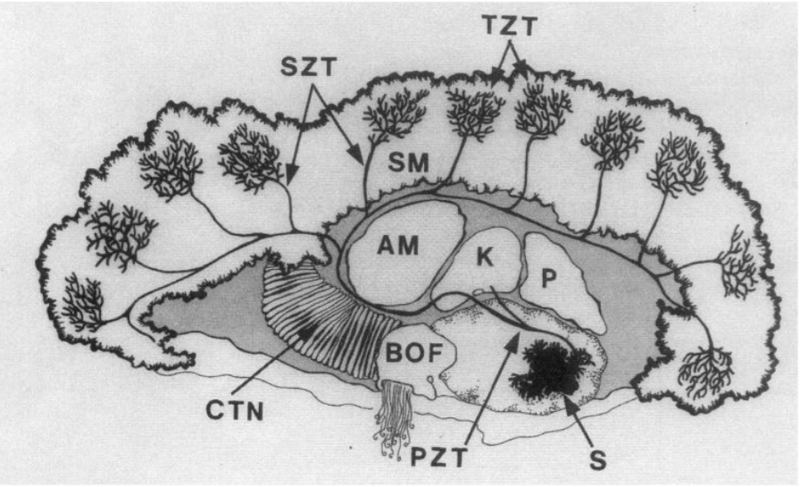 Abbreviations as follows: S = stomach; PZT = primary zooxanthellal tube; AM = adductor muscle; BOF = byssal organ/foot; CTN = ctenidia/gills; K = kidney; P = pericardium; SM = siphonal muscle; SZT = secondary zooxanthellal tube; TZT = tertiary zooxanthellal tube. What does assimilation of ammonia mean in these algal-invertebrate symbioses? Assimilation converts nitrogenous ions such as ammonia into usable organic compounds. The enzyme glutamine synthetase catalyzes the conversion of glutamate and ammonia into the amino acid glutamine. In corals and anemones, the zooxanthellae themselves are thought to produce and utilize an algal glutamine synthetase. Giant clams are unique: the clams themselves, as host, are though to do the assimilation using glutamine synthetase. Hiong et al. managed to conclusively isolate the source of glutamine synthetase in Tridacna squamosa. 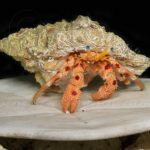 They identify the glutamine synthetase as animal-based, indicating that it is, as previously thought, produced by the host clam. The further find that it is produced specifically by the ctenidia, or gills, of the clam, pointing at the ctenidia as the sight of exogenous nitrogen assimilation. They also identify a peak of glutamine synthetase activity after 12 hours of light exposure. The glutamine synthetase gene in giant clams is therefore light-activated or light-sensitive: during daylight, the giant clam gills are taking up ammonia, and producing glutamine throughout the light hours. This glutamine is supplied as a source of nitrogen to the extracellular zooxanthellae in the outer mantle via hemolymph and fluid of the zooxanthellae tubules. This allows the normally nitrogen-limited symbionts to increase their photosynthesis rates during daylight hours.